Reaching the right person at the right place and time has been our goal from day 1. 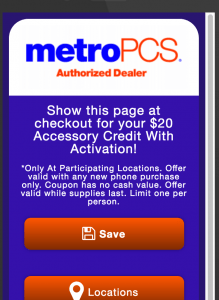 Now we are providing geofence triggered mobile coupons so that we not only can provide a relevant brand message linking to a deal, but also the deal itself with some really cool mobile features. Having a relevant message is one thing, but adding a great deal to provide to your customers is an added bonus. We recently worked with a mobile phone carrier’s authorized dealers to reach customers near their retail locations during business hours and supply them with a coupon that was device agnostic, meaning could be open with any device. The coupons also have the ability to be saved to certain smartphone wallets, emailed saved as PDF or socially shared. Trying to reach mobile customers on their current devices and offer incentive to visit store near them and switch or upgrade. By mixing dynamic ads (show miles away feature) around a radius of the retail location and other locations that were hotspots of desired customers we helped show ads with relevance. The messaging provided was for multiple savings offers and Thumbvista created mobile coupons with easy open and saving and sharing features for all devices. By using near real time data we could push different areas that showed better results and monitor coupons being claim and in some cases where they were being opened. 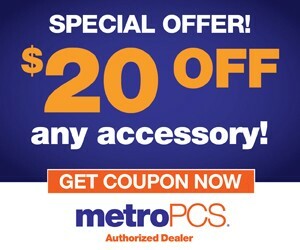 For More Information on our Mobile Coupon or Ad Solution Contact Us Today.